Rating: 4/5 – To Save the Humans Tuki Must Leave Africa Behind. 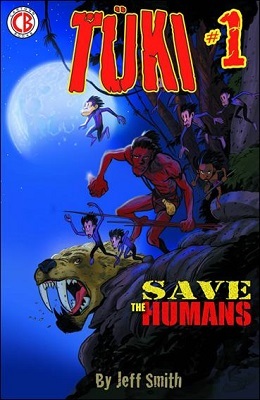 Let’s move on to the actual story: Tuki is a homo erectus and his main concern is survival. He needs to eat. A growling stomach is a sound effect used more than once in the 1st issue and it’s understandably a driving force. We don’t know yet exactly why Tuki is a loner, being in a group would have certainly been safer and grouping together for safety and mutual benefit is a trait that evolved from early humans into the human society/’civilization’ that followed. So…a loner. Why? I’ll be interested to learn more as the story evolves. Smith introduces another character, a homo habilus (the species to be replaces by homo erectus) which puts us in that transitional time period as one species is phasing out to be replaced by the one slightly more evolved … if you believe in that sort of thing…(for the record, I do). Smith is weaving a fascinating story here, which is clearly heavily researched and feels quite authentic. There are story notes included at the end of the issue that give some commentary on various pages/events in the issue. The web version has those notes directly adjacent to the page they apply to (printed right below the art) and it’s another thing that I found to work far better for me in the web version than the printed version I was reading here. The end of the first issue teases another new character and fortunately I can start reading “Season Two” right now online!” Want to check this out? Click this link right now and start reading from the start. Highly recommended! This entry was posted in cartoon books and tagged Cartoon Books, First Human, Homo Erectus, Jeff smith, Save the Humans, Tuki. Bookmark the permalink.